Andrea and Joe are Fun In the Sun Weddings’ newest newlyweds! Thank goodness this bride and groom are not superstitious or fearful or taking risks, otherwise, they might never have found their Happily-Ever-After! Andrea and Joe met each other in a later season of their lives, with 6 grown children between them, and 3 grandchildren. They first connected thanks to Andrea’s children who signed her up for a dating website. Their first date was for coffee on a Friday the 13th, and they stayed for hours, with the conversation flowing like the coffee. Neither of them was looking for a commitment, just some companionship and someone to share a meal with. They were busy people, with busy lives, careers, and dogs to feed. They say that people plan and God laughs, and we are happy that God had other plans for us! Andrea and Joe got engaged while touring Daufuskie Island in North Carolina. They were in an old civil war church and opened an old song book. The first hymn was called ‘Blessed Assurance’ and was the sign that Joe needed signaling the perfect moment to propose. 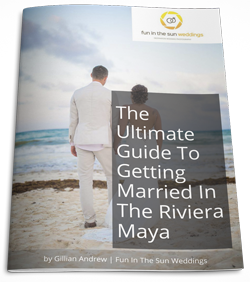 The bride and groom’s decision to get married in Playa del Carmen was an easy one. It has been a family destination for years with Andrea’s sister living here. Plus they love the area, the Mexican people and the culture. Most importantly, they wanted to take their children on a big family vacation where they could celebrate together and reconnect. It took a year of coordinating to get everyone together in one place, and with the help of the amazing Karla Liogon of Lobel Weddings who kept the long-distance bride calm and focused, they planned a simple and sophisticated authentic Mexican experience at Secret Jewel Celebrations Venue. Authentic Yucatan cuisine from chef Fredrico Lopez of Taller Gourmet was five stars in taste and presentation. Guests drank Horcheta as they arrived, and tamarind margaritas after the ‘I Dos’. A mariachi serenaded the cocktail hour. And forget about champagne toasts! The toasting was with tequila at this party! Every woman dreams of her magical wedding day, and Andrea had waited forty years for hers. She looked and felt amazing thanks to hair and makeup artist Daniel Perez Astorga. She wore a simple beach wedding dress, and her something old, borrowed and blue was her mother’s garter that she had stitched inside the gown. She tells us that her favorite moment was meeting Joe at the end of the aisle. Seeing the tears in Joe’s eyes, and being totally at peace in that moment. The feeling was pure joy! With their children grown and on their own, Andrea and Joe are now enjoying life together. They have found love, joy, peace and purpose again. And we truly couldn’t be any happier for them! Andrea and Joe, congratulations to you both. We wish you all the very best things life has to offer, and hope that your story inspires others to take a risk for love, no matter what stage of life they are in! If you are hunting for the best Playa del Carmen wedding photographers, then contact us today! 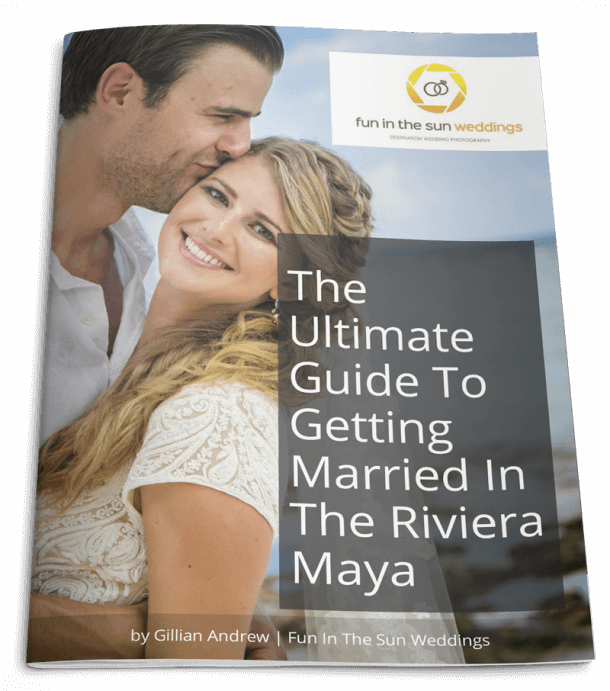 We are Fun In The Sun Weddings, the best wedding photograpers in Riviera Maya, Mexico. Want to know more about the Secret Jewel Celebrations Venue? Read unbiased reviews on Wedding Wire here. Marc made our day fun and carefree. We were relaxed as he captured our joy, our love and our special family moments. I am beyond happy and grateful. Thank you, Marc and Gillian, for memorialising our dream wedding in photographs. We love you!